What a surprise for all of us at Fall Creek to wake up to snow today. It wasn't in the forecast and we rarely get snow so it was a bit unusual and unexpected. 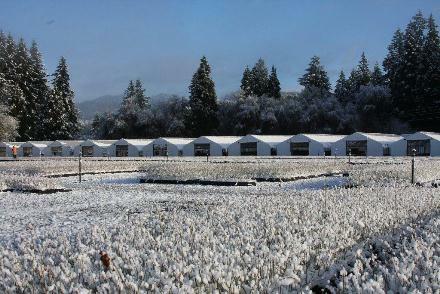 The nursery always looks really beautiful with a dusting of snow. It was a welcome change and a good reminder that it's nearly impossible to predict the weather in Oregon in March.